23-Mar-2019: Hi there! Welcome to my blog! This post from back in 2010 has become my most popular post of all time! 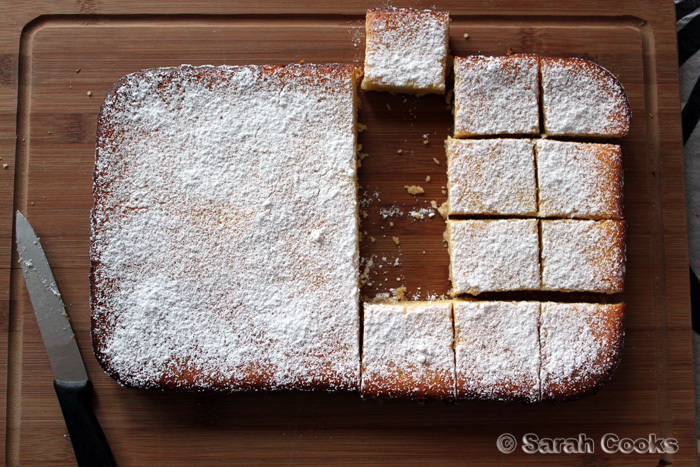 And I can certainly see why - this condensed milk lemon slice is so delicious! It's all buttery and crisp and shortbready, with a rich sweet and sharp creamy lemon topping, containing one of my favourite ingredients: sweetened condensed milk. 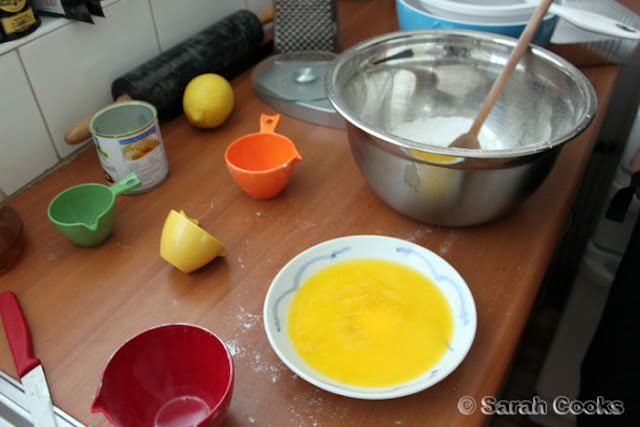 I've come back today to add the recipe at the bottom of the post to make it easier to read. Scroll right down to the bottom and get baking! Don't forget to tag me on Instagram @sarahcooksblog and hashtag #sarahcooksblog - I wanna see! Anyhoo, this one is a bit different from the standard Aussie lemon slice. It's a shortbready base, covered with a sweet and densely creamy lemon topping. ... and bake for 15 mins in a 180C oven, until golden! 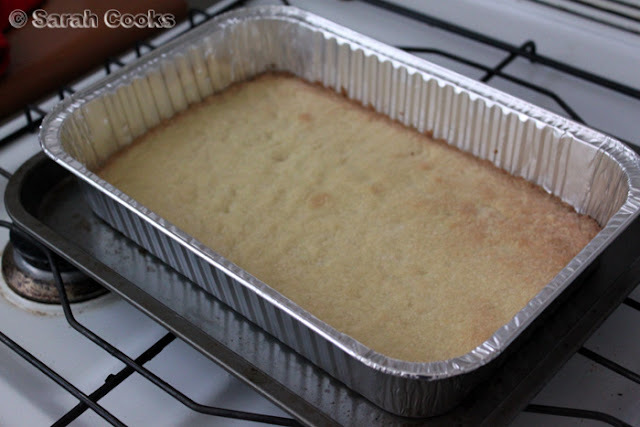 For the topping, you mix a 400gm can of condensed milk, 1 egg, 1 tbs grated lemon rind, 1/2 cup lemon juice, 2 tbs plain flour and 1 tsp baking powder. ...and bake for 25-30 minutes, or until set. As you can imagine, it was very sweet, so was best enjoyed in small slices with a cup of tea or coffee. Although there was something very compulsive about it... with its rich, caramelly filling, and crispy base, I found it hard to stop at just one piece! Grease and line a 20 x 30 cm lamington tray. (Alternatively use a foil tray, no need to line or grease). For the base, stir together the plain flour, icing sugar, and butter. 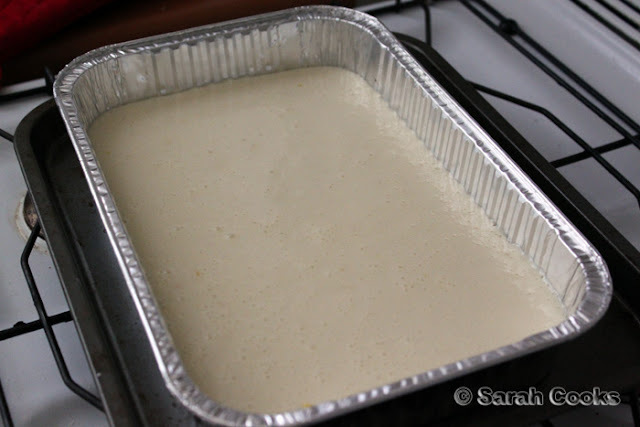 Press this mixture evenly into the prepared tray. Bake for 15 minutes, or until golden. 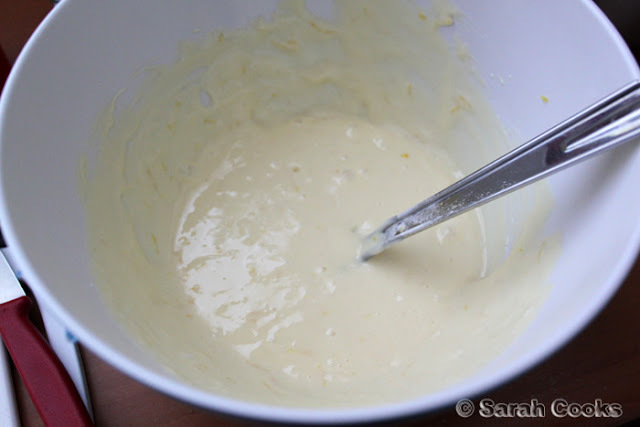 For the topping, whisk together the sweetened condensed milk, egg, lemon zest, lemon juice, plain flour and baking powder until smoothly combined. Pour the topping over the base (you don't need to wait for the base to cool completely). Return the tray to the oven and cook for 25-30 minutes, or until set. 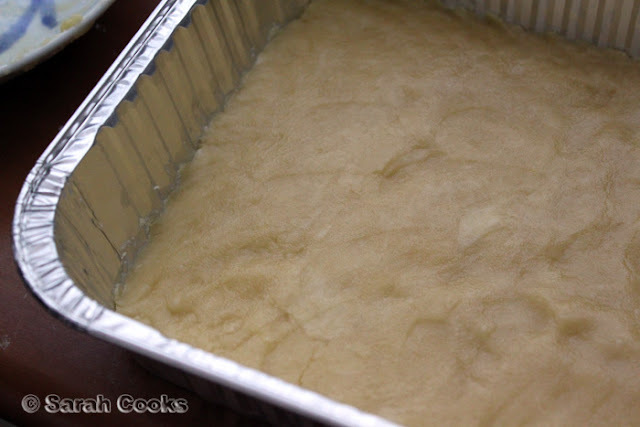 Allow to cool completely, then refrigerate. Cut into small squares to serve. 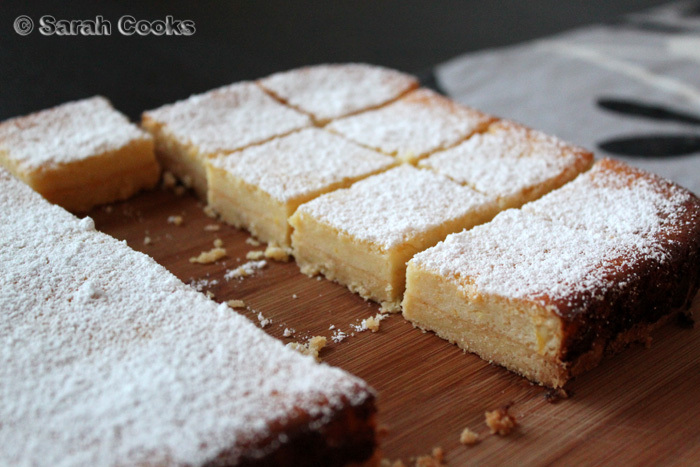 I've seen versions of this Lemon Slice for a few years now - I've made it once or twice but always seem to overcook the topping! This is the first kind I've seen with condensed milk - maybe that's the trick. Condensed milk must be one of the best things you can find in the supermarket! I often find there are good recipes on product labels, but it's always the last place you look! Oh, I'm a sucker for this sort of slice, I love anything lemony and creamy. The good old condensed milk. Actually I don't mind having a slice of that. I should make this since I have loads and loads of lemons. I was actually looking for an Aussie lemon slice recipe but saw this and decided to make it instead, so glad I did, it is amazing. Great blog too! I just found this recipe after googling it and it was the exact one I was looking for!! 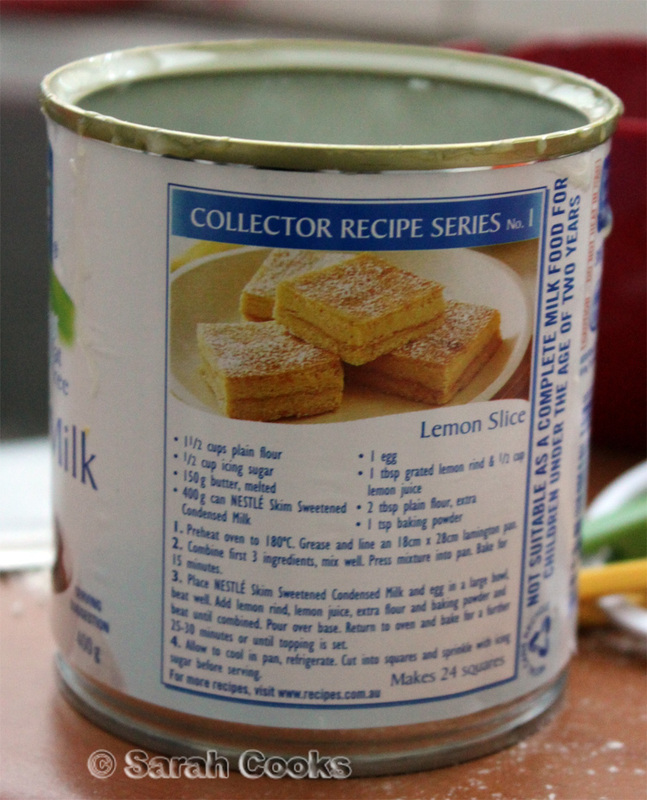 I didn't have the usual nestle condensed milk tin which I normally get the recipe from so was hoping it was on the web. Isn't it so yummy? Everyone who tries it think I'm so talented, I haven't told them the secret yet!! And it's good to find another food blog from a chinese Aussie! Love it! Thankyou for posting this recipe. I have looked all over the webpage for Nestle and they didnt have it. Its fantastic and so nice for arvo tea! For someone with a sweet tooth like moi, this is a perfect treat! (I am not the type though to put condensed milk in my coffee...)I love the combination of creamy milk and citrus-y lemon. I will be paying attention to recipes in can labels from now on. Thanks! Great recipe, and it looks great too. Yum. These bars/cake sound so scrumptious! I love all things lemon. Will have to add this to my todo list. I love a good lemon slice - these look delicious! I don't remember if i've tried a recipe with condensed milk or not - but i will definitely have to try this one out! I was just trying to work out how to use up the lemons growing on my tree in the backyard and then BAM i found your blog. Brilliant! I have never thought of using condensed milk in a slice like this, but now i have to try it!!! I was trying to find this exact recipe online (had used it once before and could not remember the details). great easy to follow pics and instructions! Add 1/2 a small tin of passionfruit pulp in syrup to the topping. It gets even better! Sarah, just so you know - Nigella's breakfast bars in 'Express' use a whole tin of condensed milk too and they're seriously delicious and full of goodies. Your lemon slices looked so wonderful I baked them last night to bring into work. The funniest thing happened though, I followed the recipe to a T and they look exactly like yours, but when I sliced them and went to pick them up the hats came off all of the shortbread base! I have no idea why this happened! So to save the day I sandwiched the hats back on with a blob of apricot jam, and called them 'Lemon and Apricot Slices'. Everyone loves them, so it's a beautiful disaster I would say! I thought I must tell you because it was such a funny thing to happen! This is so easy and delicious. I love the icing sugar in the base, it gives it a crisp texture. This is my new favourite recipe. 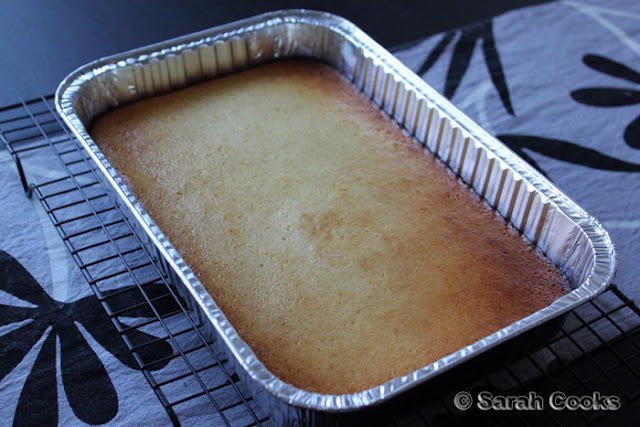 is it necessary to allow the base to cool before adding the topping? Im in the middle of doing this now, as I'm inpatient I will allow a couple of minutes for cooling but thats it. Ive also added a small handful of chia seeds to make it "healthy" (oh go on, condensed milk is surely negated by chia seeds) Great use of my laden lemon tree. i used 2 lemons for juice and 1 for zest. about to candy the other rind to flick on the top. Sorry for the delayed response! I don't think you need to let the base cool, as it goes straight back in the oven. My topping comes away from the base when you pick it up, am i doing something wrong? I'm not sure sorry, as I haven't encountered that problem making these before, but a commenter above, Rosie, had the same problem! She sandwiched them back together with jam and said they were delicious.